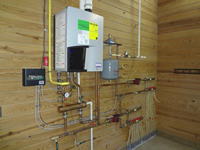 Thank You for considering Wicomico Heating and Air for your project. Please fill in the information below and we will contact you as soon as possible. At Wicomico Heating & Air Conditioning, we recognize that a sudden breakdown of your heating and cooling system can cause a major interruption to your business. We also realize that more often than not, these problems happen outside regular work hours. For your convenience, Wicomico Heating & Air Conditioning offers 24/7 emergency services for when you need us most. Our specialists have faced all types of HVAC complications and are prepared to handle any repair or AC installation, start to finish, never leaving you in anything less than a perfect indoor climate. For new AC installation, replacement, repair, maintenance and emergency service, Wicomico Heating & Air Conditioning has your heating and cooling needs covered. Since 1975, we’ve been exceeding expectations in thousands of commercial buildings throughout the entire Delmarva area. Join our growing list of satisfied business owners. Give us a call at our Salisbury MD office today! "Best of The Eastern Shore"